When it comes to awesome real to life animated graphics, Australian company Rabcat are right up there with the best of them. In this ancient adventure where you’ll be spinning 5 reels with 20 paylines; while, hunting down fiery dragons, entering the dragons’ lair itself and spinning in 2 way winning combos in search of a Dragons Bounty that will leave you with a bank full of cash. Win 2 ways paylines are the latest challenge to the new 243 Ways and 1024 Ways payline slots. It is a unique way to line up symbols from left to right or from right to left on the reels. 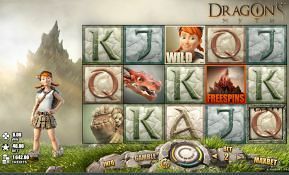 With 5 reels on the non-progressive Dragons Myth jackpot and 3 symbols on each reel, this ancient mystical slot tells a story of a powerful girl able to valiantly control a centuries old plague (dragons) while helping you win big with wilds, scatters, free spins and a bonus symbol leading straight to the jackpot hidden in the Dragons’ cave. This slot truly has some red hot action awaiting him or her that dares enter! Legend tells of a tail of an exceptional young girl with powers that are so influential she could be the answer to 4 evil dragons that have long been taking the lives of her fellow people and precious livestock. In this audacious slot adventure the young girl embarks on this dangerous mission with you at the helm of the reels helping her navigate closer to hunting down 4 scary fire spitting dragons. And once you have taken enough risks and rolled through the picturesque mountains where the dragons have chosen to take refuge, you get to eliminate the beasts and come out on the other end with a huge reward. There are plenty of features to help you along the way, plus you will be more than taken in by what is an awe-inspiring theme with breath-taking scenery that makes it hard to believe such evil could be lurking in such beautiful landscapes. When the bonus symbol lands on the reels you are in for some magical winning combinations and the chance to trigger the free spins round at the same time. You will sly directly to the dragons’ cave where 2 wild symbols will await. Place them anywhere on reels 2 and 4 to strategically give you the chance of a high paying set of winning combinations. As an added bonus, the way you place the symbols could mean that you additionally trigger the free spins where you can capture the dragons and hit an awesome jackpot pay out if you haven’t already done so when placing the wild symbol earlier in the game. On most slots the norm is to line up the first symbol on reel 1 to start a winning combination. From here, a symbol must run along the adjacent reels. For instance, a 3 of a kind combination will be the same symbol on reel 1, reel 2 and reel 3 to count. Therefore, there cannot be a gap in between the winning symbols. With 2 ways to win this concept still exists, plus as an added bonus, you can line the up the other way too. Meaning you can line up combinations on adjacent reels starting on reel 5. A 3 of kind combination would count if symbols start on reel 5 and move across adjacent reels 4 and 3. Roll closer to the Dragons’ lair with free spins that come up as regular as clockwork. 3 scatters can land absolutely anywhere on the reels without being tied to any payline. They can land in random positions in order to award you entry it a high paying free spins round where the reels remain as 2 ways to win. You are guaranteed to come out of any free spins round on this slot with a large amount of cash. Each time you spin in a win, there is a chance to gamble the win and get more for your money. Sometimes you win and sometimes you lose, but if you are good with odds, you can time your gambles perfectly going with the odds of probability enabling you to come out with more cash than you or the dragons bargained for. 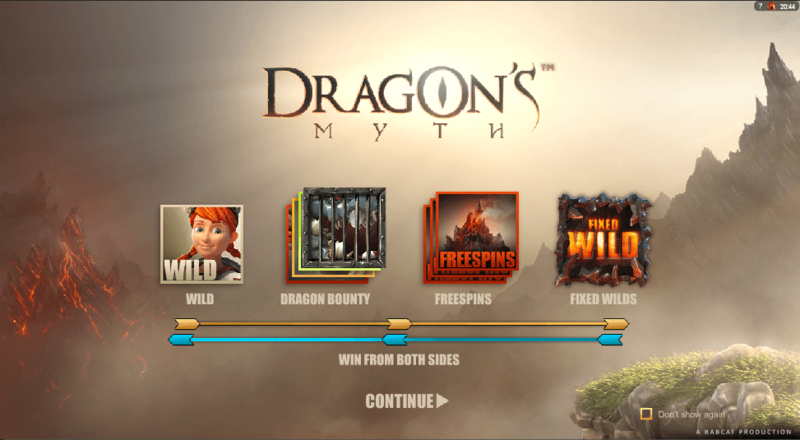 Rabcat have made it much easier to spin in combination wins on the Dragons Myth slot largely thanks to its win both ways pay-line feature. With the ability to line up symbols from reel 5 to reel 1 and reel 1 to reel 5. With all these awesome features brought together there is a massive 96.6% RTP playing Dragons Myth! Where can I play Rabcat Games? Look for top online casinos such as VegasParadise.com and JackpotParadise.com they use NYX and Microgaming both of which stream Rabcat games through their intelligent software platforms. Rabcat is a partner of NYX, but also teams up with other online casino platform providers to get its games out there for you to enjoy.